This is a learning trend to watch. Here is an article from Fast Company titled A for Apps. When the Singer sisters were just 6 months old, they already preferred cell phones to almost any other toy, recalls their mom, Fiona Aboud Singer: “They loved to push the buttons and see it light up.” The girls knew most of the alphabet by 18 months and are now starting to read, partly thanks to an iPhone app called First Words, which lets them move tiles along the screen to spell c-o-w and d-o-g. They sing along with the Old MacDonald app too, where they can move a bug-eyed cartoon sheep or rooster inside a corral, and they borrow Mom’s tablet computer and photo-editing software for a 21st-century version of finger painting. “They just don’t have that barrier that technology is hard or that they can’t figure it out,” Singer says. Gemma and Eliana belong to a generation that has never known a world without ubiquitous handheld and networked technology. American children now spend 7.5 hours a day absorbing and creating media — as much time as they spend in school. Once in a while I chance upon something that really touches something deep inside. This is one of those.I am happy that I went to PFTF and listened to Bill speak and recite a poem and then later post a link to the poem on the CoLab Wiki. A few tweets, some notes (in my own desktop wiki) and a few thoughts later, I arrived here. One of the most novel home pages of any website, I have every seen. 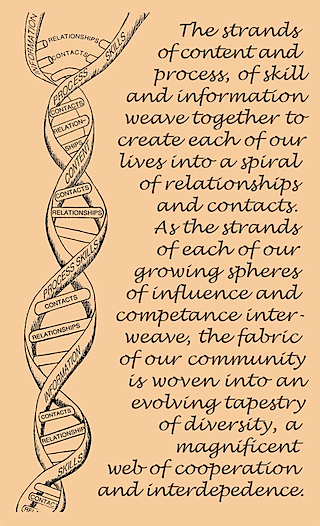 The spiral of relationships – that is what life is all about.